John the Apostle (Aramaic: יוחנן שליחא‎ Yohanān Shliḥā; Hebrew: יוחנן בן זבדי Yohanan ben Zavdi; Koine Greek: Ἰωάννης; Coptic: ⲓⲱⲁⲛⲛⲏⲥ or ⲓⲱ̅ⲁ; Latin: Ioannes; c. AD 6 – c. 100) was one of the Twelve Apostles of Jesus according to the New Testament, which refers to him as Ἰωάννης. Generally listed as the youngest apostle, he was the son of Zebedee and Salome or Joanna. His brother was James, who was another of the Twelve Apostles. The Church Fathers identify him as John the Evangelist, John of Patmos, John the Elder and the Beloved Disciple, and testify that he outlived the remaining apostles and that he was the only one to die of natural causes. The traditions of most Christian denominations have held that John the Apostle is the author of several books of the New Testament. Russian Orthodox icon of the Apostle and Evangelist John the Theologian, 18th century (Iconostasis from the Church of the Transfiguration, Kizhi Monastery. John the Apostle was the son of Zebedee and the younger brother of James, son of Zebedee (James the Greater). According to Church tradition, their mother was Salome. He was first a disciple of John the Baptist. John is traditionally believed to be one of two disciples (the other being Andrew), as recounted in John 1: 35-39, hearing the Baptist point out Jesus as the "Lamb of God", followed Jesus and spent the day with him. Zebedee and his sons fished in the Sea of Galilee. Jesus then called Peter, Andrew and these two sons of Zebedee to follow him. James and John are listed among the Twelve Apostles. Jesus referred to the pair as "Boanerges" (translated "sons of thunder"). A gospel story relates how the brothers wanted to call down heavenly fire on an unhospitable Samaritan town, but Jesus rebuked them. [Lk 9:51-6] John lived for more than half a century following the martyrdom of James, who was the first Apostle to die a martyr's death. Peter, James and John were the only witnesses of the raising of the Daughter of Jairus. All three also witnessed the Transfiguration, and these same three witnessed the Agony in Gethsemane more closely than the other Apostles did. John was the disciple who reported to Jesus that they had 'forbidden' a non-disciple from casting out demons in Jesus' name, prompting Jesus to state that 'he who is not against us is on our side'. Jesus sent only John and Peter into the city to make the preparation for the final Passover meal (the Last Supper). [Lk 22:8] At the meal itself, the "disciple whom Jesus loved" sat next to Jesus. It was customary to lie along upon couches at meals, and this disciple leaned on Jesus. Tradition identifies this disciple as Saint John[Jn 13:23-25]. After the arrest of Jesus, Peter and the "other disciple" (according to Sacred Tradition), John followed him into the palace of the high-priest. While he remained in Judea and the surrounding area, the other disciples returned to Jerusalem for the Apostolic Council (about AD 51). Paul, in opposing his enemies in Galatia, recalls that John explicitly, along with Peter and James the Just, were referred to as "pillars of the church" and refers to the recognition that his Apostolic preaching of a gospel free from Jewish Law received from these three, the most prominent men of the messianic community at Jerusalem. The phrase the disciple whom Jesus loved (Greek: ὁ μαθητὴς ὃν ἠγάπα ὁ Ἰησοῦς, ho mathētēs hon ēgapā ho Iēsous) or, in John 20:2, the Beloved Disciple (Greek: ὃν ἐφίλει ὁ Ἰησοῦς, hon ephilei ho Iēsous) is used five times in the Gospel of John, but in no other New Testament accounts of Jesus. John 21:24 claims that the Gospel of John is based on the written testimony of this disciple. None of the other Gospels has anyone in the parallel scenes that could be directly understood as the Beloved Disciple. For example, in Luke 24:12, Peter alone runs to the tomb. 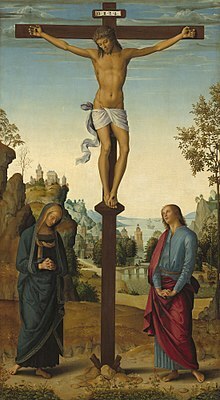 Mark, Matthew and Luke do not mention any one of the twelve disciples having witnessed the crucifixion. There are also two references to an unnamed "other disciple" in John 1:35-40 and John 18:15-16, which may be to the same person based on the wording in John 20:2. Church tradition has held that John is the author of the Gospel of John and four other books of the New Testament — the three Epistles of John and the Book of Revelation. In the Gospel, authorship is internally credited to the "disciple whom Jesus loved" (ὁ μαθητὴς ὃν ἠγάπα ὁ Ἰησοῦς, o mathētēs on ēgapa o Iēsous) in John 20:2. John 21:24 claims that the Gospel of John is based on the written testimony of the "Beloved Disciple". The authorship of some Johannine literature has been debated since about the year 200. In his Ecclesiastical History, Eusebius says that the First Epistle of John and the Gospel of John are widely agreed upon as his. However, Eusebius mentions that the consensus is that the second and third epistles of John are not his but were written by some other John. Eusebius also goes to some length to establish with the reader that there is no general consensus regarding the revelation of John. The revelation of John could only be what is now called the Book of Revelation. The Gospel according to John differs considerably from the Synoptic Gospels, which were likely written decades earlier. The bishops of Asia Minor supposedly requested him to write his gospel to deal with the heresy of the Ebionites, who asserted that Christ did not exist before Mary. John probably knew and undoubtedly approved of the Gospels of Matthew, Mark, and Luke, but these gospels spoke of Jesus primarily in the year following the imprisonment and death of John the Baptist. Around 600, however, Sophronius of Jerusalem noted that “two epistles bearing his name ... are considered by some to be the work of a certain John the Elder” and, while stating that Revelation was written by John of Patmos, it was “later translated by Justin Martyr and Irenaeus,” presumably in an attempt to reconcile tradition with the obvious differences in Greek style. Until the 19th century, the authorship of the Gospel of John had been attributed to the Apostle John. However, most modern critical scholars have their doubts. Some scholars place the Gospel of John somewhere between AD 65 and 85;[page needed] John Robinson proposes an initial edition by 50–55 and then a final edition by 65 due to narrative similarities with Paul. :pp.284,307 Other scholars are of the opinion that the Gospel of John was composed in two or three stages. :p.43 Most contemporary scholars consider that the Gospel was not written until the latter third of the first century AD, and with an earliest possible date of AD 75-80. “...a date of AD 75-80 as the earliest possible date of composition for this Gospel.” Other scholars think that an even later date, perhaps even the last decade of the first century AD right up to the start of the 2nd century (i.e. 90 - 100), is applicable. The Gospel of John was written by an anonymous author. According to Paul N. Anderson, the gospel “contains more direct claims to eyewitness origins than any of the other Gospel traditions.” F. F. Bruce argues that 19:35 contains an “emphatic and explicit claim to eyewitness authority.” Bart D. Ehrman, however, does not think the gospel claims to have been written by direct witnesses to the reported events. The author of the Book of Revelation identifies himself as “Ἰωάννης” (“John” in standard English translation) The early 2nd century writer, Justin Martyr, was the first to equate the author of Revelation with John the Apostle. However, most biblical scholars now contend that these were separate individuals. John the Presbyter, an obscure figure in the early church, has also been identified with the seer of the Book of Revelation by such authors as Eusebius in his Church History (Book III, 39)  and Jerome. Byzantine illumination depicting John dictating to his disciple, Prochorus (c. 1100). Tomb of St. John the Apostle, in St. John's Basilica, Ephesus, near modern-day Selçuk, Turkey. 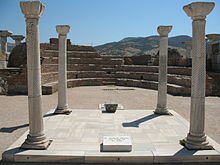 A messianic community existed at Ephesus before Paul's first labors there (cf. "the brethren"),[Acts 18:27] in addition to Priscilla and Aquila. The original community was under the leadership of Apollos (1 Corinthians 1:12). They were disciples of John the Baptist and were converted by Aquila and Priscilla. According to Church tradition, after the Assumption of Mary, John went to Ephesus. From there he wrote the three epistles attributed to him. John was allegedly banished by the Roman authorities to the Greek island of Patmos, where, according to tradition, he wrote the Book of Revelation. According to Tertullian (in The Prescription of Heretics) John was banished (presumably to Patmos) after being plunged into boiling oil in Rome and suffering nothing from it. It is said that all in the audience of Colosseum were converted to Christianity upon witnessing this miracle. This event would have occurred in the late 1st century, during the reign of the Emperor Domitian, who was known for his persecution of Christians. It is traditionally believed that John was the youngest of the apostles and survived them. He is said to have lived to an old age, dying at Ephesus sometime after AD 98. An alternative account of John's death, ascribed by later Christian writers to the early second-century bishop Papias of Hierapolis, claims that he was slain by the Jews. Most Johannine scholars doubt the reliability of its ascription to Papias, but a minority, including B.W. Bacon, Martin Hengel and Henry Barclay Swete, maintain that these references to Papias are credible. Zahn argues that this reference is actually to John the Baptist. John's traditional tomb is thought to be located at Selçuk, a small town in the vicinity of Ephesus. John is also associated with the pseudepigraphal apocryphal text of the Acts of John, which is traditionally viewed as written by John himself or his disciple, Leucius Charinus. It was widely circulated by the second century CE but deemed heretical at the Second Council of Nicaea (787 CE). Varying fragments survived in Greek and Latin within monastic libraries. It contains strong docetic themes, but is not considered in modern scholarship to be gnostic. The feast day of Saint John in the Roman Catholic Church, which calls him "Saint John, Apostle and Evangelist", and in the Anglican Communion and Lutheran Calendars, which call him "Saint John the Apostle and Evangelist", is on 27 December. In the Tridentine Calendar he was commemorated also on each of the following days up to and including 3 January, the Octave of the 27 December feast. This Octave was abolished by Pope Pius XII in 1955. The traditional liturgical color is white. Until 1960, another feast day which appeared in the General Roman Calendar is that of "Saint John Before the Latin Gate" on 6 May, celebrating a tradition recounted by Jerome that St John was brought to Rome during the reign of the Emperor Domitian, and was thrown in a vat of boiling oil, from which he was miraculously preserved unharmed. A church (San Giovanni a Porta Latina) dedicated to him was built near the Latin gate of Rome, the traditional site of this event. The Orthodox Church and those Eastern Catholic Churches which follow the Byzantine Rite commemorate the "Repose of the Holy Apostle and Evangelist John the Theologian" on 26 September. On 8 May they celebrate the "Feast of the Holy Apostle and Evangelist John the Theologian", on which date Christians used to draw forth from his grave fine ashes which were believed to be effective for healing the sick. The Church of Jesus Christ of Latter-day Saints (LDS Church) teaches that, "John is mentioned frequently in latter-day revelation (1 Ne. 14:18–27; 3 Ne. 28:6; Ether 4:16; D&C 7; 27:12; 61:14; 77; 88:141). These passages confirm the biblical record of John and also provide insight into his greatness and the importance of the work the Lord has given him to do on the earth in New Testament times and in the last days. The latter-day scriptures clarify that John did not die but was allowed to remain on the earth as a ministering servant until the time of the Lord’s Second Coming (John 21:20–23; 3 Ne. 28:6–7; D&C 7)" . It also teaches that in 1829, along with the resurrected Peter and the resurrected James, John visited Joseph Smith and Oliver Cowdery and restored the priesthood authority with Apostolic succession to earth. John, along with the Three Nephites, will live to see the Second Coming of Christ as translated beings. The Church of Jesus Christ of Latter-day Saints teaches that John the Apostle is the same person as John the Evangelist, John of Patmos, and the Beloved Disciple. The Quran also speaks of Jesus's disciples but does not mention their names, instead referring to them as "helpers to the work of God". Muslim exegesis and Quran commentary, however, names them and includes John among the disciples. An old tradition, which involves the legend of Habib the Carpenter, mentions that John was one of the three disciples sent to Antioch to preach to the people there. As he was traditionally identified with the beloved apostle, the evangelist, and the author of the Revelation and several Epistles, John played an extremely prominent role in art from the early Christian period onward. He is traditionally depicted in one of two distinct ways: either as an aged man with a white or gray beard, or alternatively as a beardless youth. The first way of depicting him was more common in Byzantine art, where it was possibly influenced by antique depictions of Socrates; the second was more common in the art of Medieval Western Europe, and can be dated back as far as 4th century Rome. Legends from the Acts of John, an apocryphal text attributed to John, contributed much to Medieval iconography; it is the source of the idea that John became an apostle at a young age. One of John's familiar attributes is the chalice, often with a serpent emerging from it. This symbol is interpreted as a reference to a legend from the Acts of John, in which John was challenged to drink a cup of poison to demonstrate the power of his faith (the poison being symbolized by the serpent). Other common attributes include a book or scroll, in reference to the writings traditionally attributed to him, and an eagle, which is argued to symbolize the high-soaring, inspirational quality of these writings. ^ "Saint John the Apostle". Encyclopædia Britannica. Nor do we have reliable accounts from later times. What we have are legends, about some of the apostles – chiefly Peter, Paul, Thomas, Andrew, and John. But the apocryphal Acts that tell their stories are indeed highly apocryphal. —  Bart Ehrman, Emerson Green, "Who Would Die for a Lie?" ^ Media, Franciscan (27 December 2015). "Saint John the Apostle". ^ a b "Fonck, Leopold. "St. John the Evangelist." The Catholic Encyclopedia. Vol. 8. New York: Robert Appleton Company, 1910. 6 Feb. 2013". Newadvent.org. 1 October 1910. Retrieved 3 May 2013. ^ a b c "St John The Evangelist". www.ewtn.com. ^ James D. G. Dunn and John William Rogerson, Eerdmans Commentary on the Bible, Wm. B. Eerdmans Publishing, 2003, p. 1210, ISBN 0-8028-3711-5. ^ Brown, Raymond E. 1970. "The Gospel According to John (xiii-xxi)". New York: Doubleday & Co. Pages 922, 955. ^ Eusebius of Caesarea, Ecclesiastical History Book vi. Chapter xxv. ^ The History of the Church by Eusibius. Book three, point 24. ^ Thomas Patrick Halton, On illustrious men, Volume 100 of The Fathers of the Church, CUA Press, 1999. P. 19. ^ Robinson, John A.T. (1977). Redating the New Testament. SCM Press. ISBN 978-0-334-02300-5. ^ Kruse, Colin G.The Gospel According to John: An Introduction and Commentary, Eerdmans, 2004, ISBN 0-8028-2771-3, p. 28. ^ a b Bart D. Ehrman (2005:235) Lost Christianities: the battles for scripture and the faiths we never knew Oxford University Press, New York. ^ Geoffrey W. Bromiley (1995:287) International Standard Bible Encyclopedia: K-P MATTHEW, GOSPEL ACCORDING TO. Wm. B. Eerdmans Publishing. Quote: "Matthew, like the other three Gospels is an anonymous document." ^ Ben Witherington (2004:44) The Gospel code: novel claims about Jesus, Mary Magdalene, and Da Vinci InterVarsity Press. ^ F.F. Bruce (1994:1) The Gospel of John Wm. B. Eerdmans Publishing. ^ Paul N. Anderson, The Riddles of the Fourth Gospel, p. 48. ^ F. F. Bruce, The Gospel of John, p. 3. ^ Bart D. Ehrman(2006:143) The lost Gospel of Judas Iscariot: a new look at betrayer and betrayed. Oxford University Press. ^ "Church History, Book III, Chapter 39". The Fathers of the Church. NewAdvent.org. Retrieved 1 June 2015. ^ saint, Jerome. "De Viris Illustribus (On Illustrious Men) Chapter 9 & 18". newadvent.org. Retrieved 2 June 2015. ^ Adela Collins. "Patmos." Harper's Bible Dictionary. Paul J. Achtemeier, gen. ed. San Francisco: Harper & Row, 1985. p755. ^ Griggs, C. Wilfred. "John the Beloved" in Ludlow, Daniel H., ed. Selections from the Encyclopedia of Mormonism: Scriptures of the Church (Salt Lake City, Utah: Deseret Book, 1992) p. 379. Griggs favors the "one John" theory but mentions that some modern scholars have hypothesized that there are multiple Johns. ^ Introduction. Saint Joseph Edition of the New American Bible: Translated from the Original Languages with Critical Use of All the Ancient Sources : including the Revised New Testament and the Revised Psalms. New York: Catholic Book Pub., 1992. 386. Print. ^ "Vailhé, Siméon. "Ephesus." The Catholic Encyclopedia. Vol. 5. New York: Robert Appleton Company, 1909. 6 Feb. 2013". Newadvent.org. 1 May 1909. Retrieved 3 May 2013. ^ Irenaeus, Against Heresies, III.3.4. ^ a b "John the Apostle". www.ccel.org. ^ Cheyne, Thomas Kelly (1901). Encyclopaedia Biblica, Volume 2. Adam and Charles Black. pp. 2509–11. Although Papias' works are no longer extant, the fifth century ecclesiastical historian Philip of Side and the ninth-century monk George Hamartolos both stated that Papias had written that John was "slain by the Jews." ^ Rasimus, Tuomas (2010). The Legacy of John: Second-Century Reception of the Fourth Gospel. BRILL. p. 5. ISBN 9789004176331. Rasimus finds corroborating evidence for this tradition in "two martyrologies from Edessa and Carthage" and writes that "Mark 10:35-40//Matt. 20:20-23 can be taken to portray Jesus predicting the martyrdom of both the sons of Zebedee." ^ Culpepper, R. Alan (2000). John, the Son of Zebedee: The Life of A Legend. Continuum International Publishing Group. p. 172. ISBN 9780567087423. ^ Swete, Henry Barclay (1911). The Apocalypse of St. John (3 ed.). Macmillan. pp. 179–180. ^ "The Acts of John". gnosis.org. Retrieved 11 February 2019. ^ "John, Son of Zebedee". www.lds.org. ^ a b c d "Saint John the Apostle". Encyclopædia Britannica Online. Chicago, Illinois: Encyclopædia Britannica, Inc. Retrieved 4 August 2017. ^ Richard Dorment (15 February 1997). "The Sacred and the Sensual". The Daily Telegraph. Wikisource has the text of the 1911 Encyclopædia Britannica article John, the Apostle.